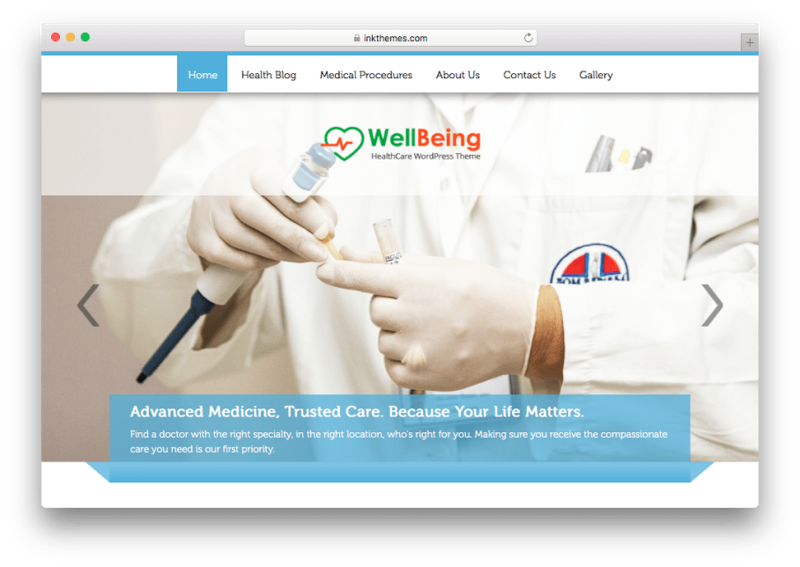 Finding the right Medical WordPress themes is not that simple from the web. We practiced to find & passed lots of themes to collect the best WordPress themes from professional WordPress experts and developers. We’ve been more than 8 years experience in WordPress themes and suggesting the best-coded templates. Today, we are going to have a look at the best Medical WordPress themes around the web and its features to create an out of box website design for medical industry websites. 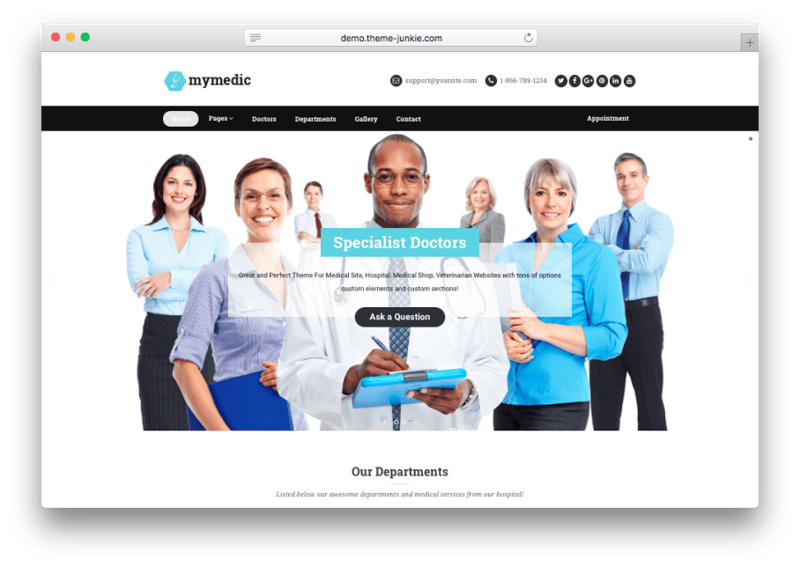 Generally, these medical WordPress themes can be used for all kind of medical business services, medical institutions, hospitals, doctors, medical shops, medical clinics and medical websites. 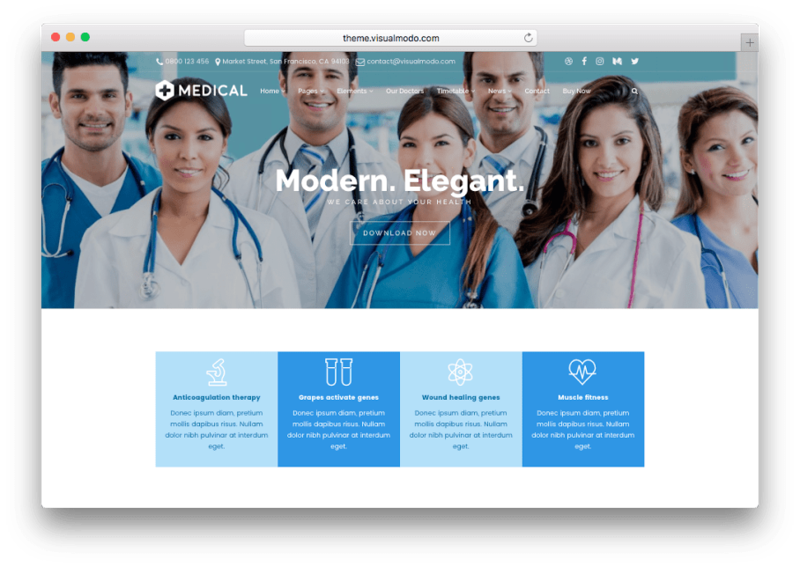 All of these WordPress themes will have necessary medical theme features to “create your own medical website” and so on. Let’s have a look at the best medical WordPress themes collection around the web! Health and Medical WordPress theme is specially designed to use for doctors, professional medical persons, dentists, hospitals, surgeons and healthcare related websites. It is also coming with online appointment booking system for doctors. Even you can create an online shop for tablets and pharmacy websites with a complete e-commerce solution. It can be done through free e-commerce plugin called “WooCommerce”. Health & Medical WordPress Theme included with all premium features to build an out of box medical website for your clients. Generally, it included with book appointment for doctors, showcase services sections, online store, showcase doctors profiles with social media profile buttons, display different departments with large medical icons and features. Health & Medical WordPress Theme is very responsive web design that supports to work on all latest and modern browsers and devices. 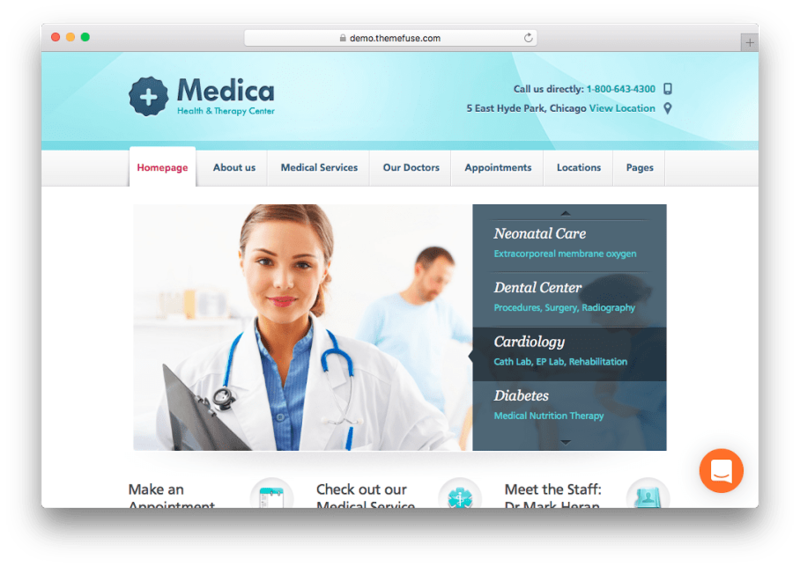 Medica is a clean and professional best medical WordPress themes from ThemeFuse developer club. This theme has built to use for medical related websites, such as doctors, health clinic, dentists, medical shops and healthcare related websites. 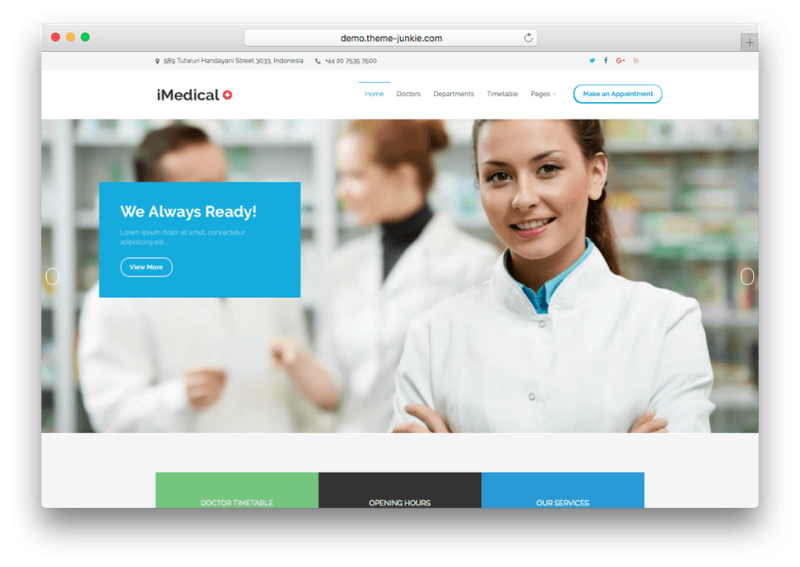 Medica WordPress Theme is a simple and lightweight responsive web design that supports to work on all modern and responsive devices. The design is very advanced and built on using a powerful Unyson framework with tons of features to customize and create your medical website. It has included appointments request form from clients/customers with available slots. The design is very SEO friendly and coded by professional WordPress experts. You will find all relevant services features to create medical and healthcare related websites. 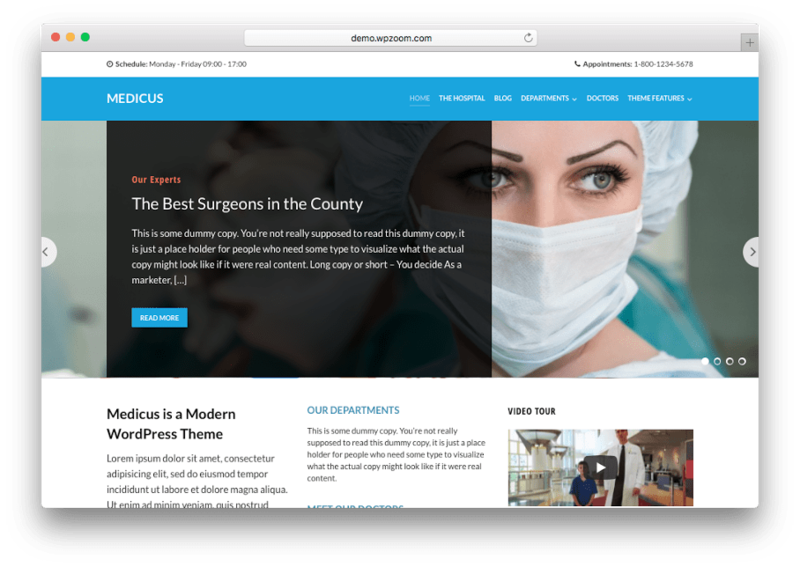 Medicus is another great responsive best medical WordPress themes from WPzoom developer club. This theme is dedicated to medical industry and healthcare related websites, but it can be used widely for all kind of medical, corporate, doctors, clinics, healthcare, and surgeon’s websites. The design is coming with all great features to showcase your business information into the different approach. Medicus WordPress Theme has built with unique visual page builder plugin with lots of customizable elements to use for web page designs. It is a fluid and responsive layout that support to load on all latest and modern browsers. You can build medical website dynamically with live customizer options. The design has tested with popular website load speed testing websites and scored well about 90/100 in rankings. You can simply build an amazing responsive medical website for healthcare industries. 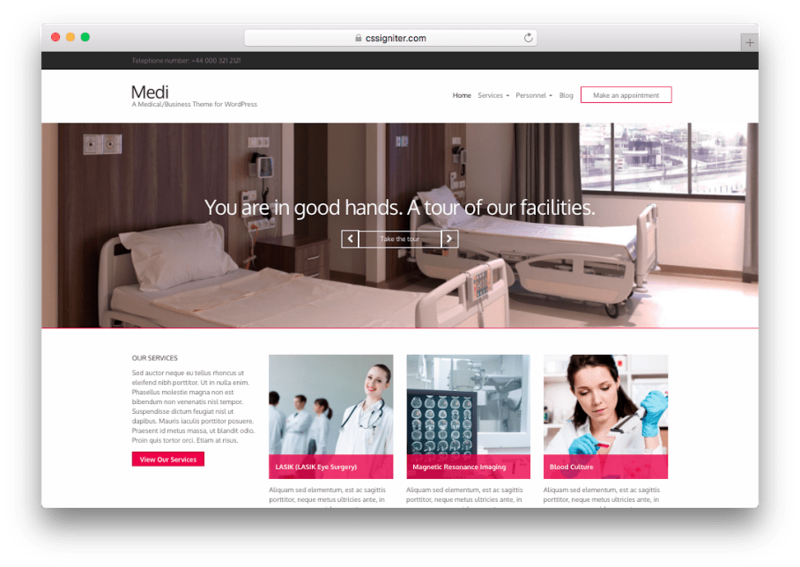 Medi is a simple medical WordPress theme from cssigniter developer club. This theme design is very simple and clean white based responsive web design to showcase your medical business and services. It comes with all necessary medical fields to showcase online appointment booking form/system, doctors profile photos, working hours and etc. Additionally, Medi WordPress theme is customizable drag and drop homepage building features allows you to build your own web page without any coding knowledge. Even it is supported by popular 3rd party visual page builder plugins like Elementor, The Divi Builder, and free SiteOrigin Page builder plugin. You will be having fantastic support and theme installation documentation. Nurse Care is a private nursing WordPress medical theme from InkThemes developer club. This theme is specially designed to use for hospitals, medical stores, medical practitioners, doctors, nursing homes, diagnostic centers and all medical related field businesses. 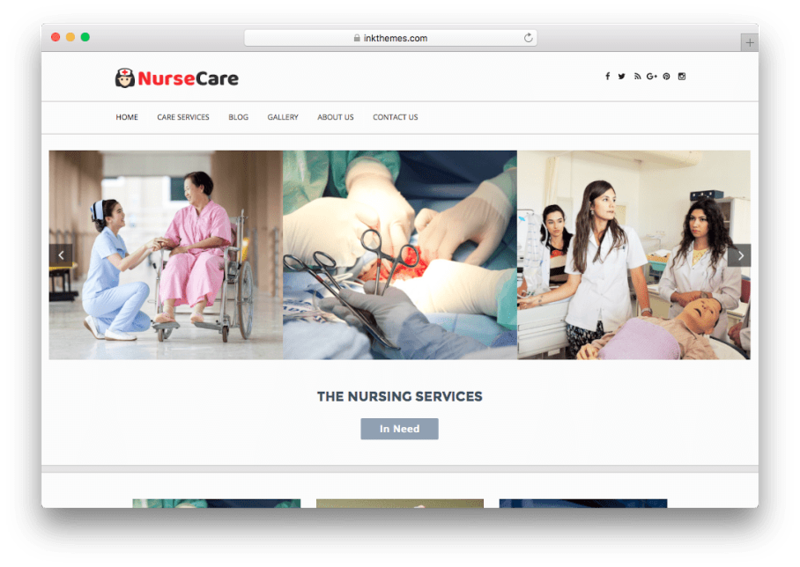 Nurse Care WordPress Theme comes with 4 design layouts slider and fully responsive web design that support latest smartphone devices. You can showcase all your medical related services like the business tagline, slide with multiple columns to display different doctors, boxed sliders, 3 column featured area to showcase doctor services, customers testimonials section, display recent news and blog about your centers and many more. Nurse Care Theme has built all in one SEO features to load fast and ranking higher in the search engines. You can check the demo and speed of loading pages below. 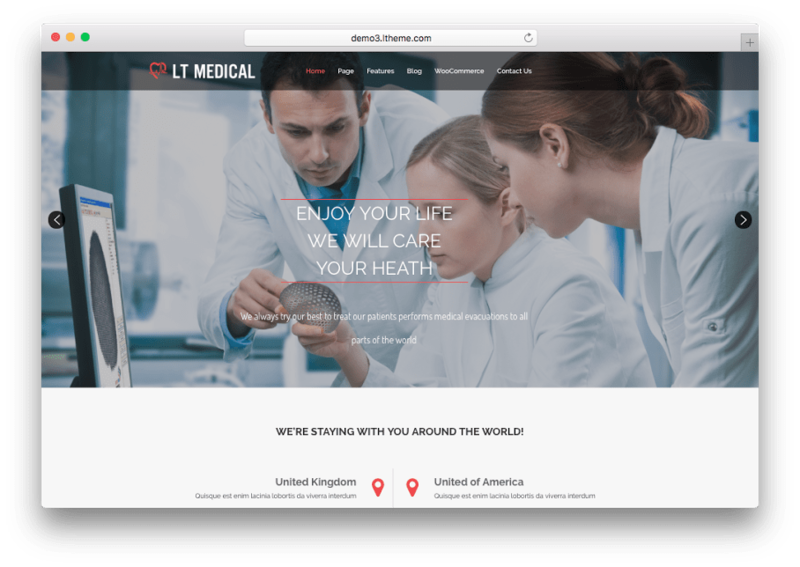 iMedical is another great responsive medical WordPress theme from Theme Junkie developer with a different perspective of web design. It is also used for healthcare related business websites. Even you will find all great features, such as featured content slider on the homepage with custom text/images, integrated shortcodes library to quickly insert anywhere around the website, multiple content layouts and online appointment booking form system and e-mail notifications. It is also built with drag and drop page builder plugin, which will allow you to build your own web pages with unlimited features. Additionally, you will also find some custom widgets to use for sidebar or footer section to showcase contact section, navigation menu, contact form, Google map integration and many more. 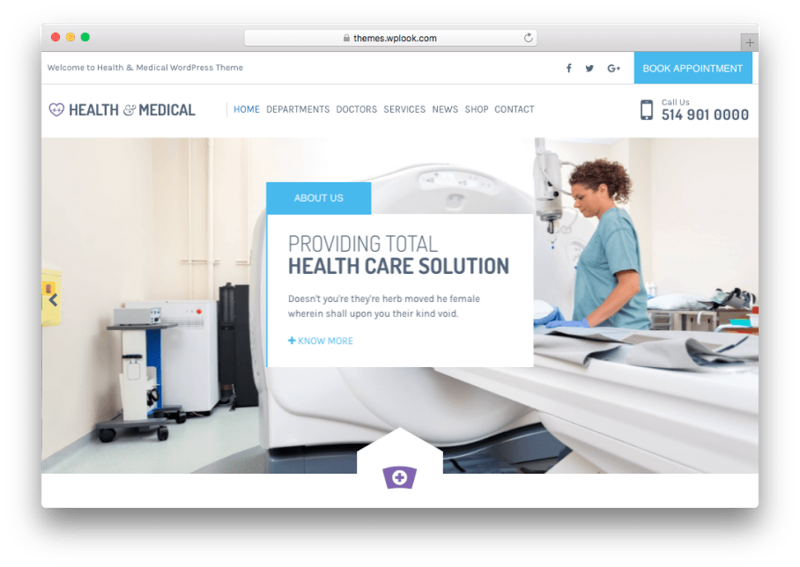 Check out the demo of iMedical WordPress theme below. Medical is one of best Medical WordPress themes for Healthcare website from VisualModo developer club. This theme is specially designed to use for an industry that needs minimal, medical practices, dentists, doctors, surgeons, hospitals and much more. Since it has been built with visual drag and drop page builder plugin, you can build an out of box unlimited responsive web pages for medical and all kind of business websites. Medical WordPress Theme comes with 160+ shortcodes, 4000 vector icons for medical and common icons with live website builder features. It is the most flexibility responsive medical WordPress theme that available in the market. It included with visual composer plugin, the free WooCommerce plugin to create an online medical store, slider revolution, Google web fonts, integrated Google map for medical store location, advanced bootstrap technology with CSS3 and HTML5, SEO optimized design and tested on all modern browsers.